First it was new designer chairs and muted colours, now McDonald’s in the UK have decided that the staff themselves need a design overhaul and have replaced the brightly coloured uniforms of the burger-flippers of yore with a smarter, sleeker range of designs by UK design institution Bruce Oldfield. McDonald’s is providing its staff with a new range of uniforms designed by Bruce Oldfield, famous for dressing Princess Diana, Jemima Khan and Sienna Miller, in an attempt to appear more upmarket. The old outfit’s bright colours have been replaced with more subtle shades of black, beige and brown for the air-hostess style uniforms. Female management and front of house staff will wear high heels, pencil skirts and scarves, male counterparts will have suits, and the staff who serve the food will wear polo shirts, all in similar colours. The new uniform will appear in the UK next month for all 67,000 workers to complement the company’s restyled restaurants, at a cost of £2m. McDonald’s said that the clothes made staff feel more confident and customers respect them more. Oldfield said that it had been fun to design the “contemporary look” for employees at McDonald’s and that he had come up with a design that is practical and stylish. Advertisement Vs Reality is the name of a project by Pundo3000 that has photographed and compared the images on food packaging with the actual products inside. It’s no surprise to anyone to find blatant mis-advertising on food, and this site created by German journalist Samuel Mueller shows 100 of the worst in what he explains is a true light, with no additions or alterations to add effect. See some of the most unappealing items on this video. Are adverts getting more provocative or a people getting more paranoid? After the uproar over glamorised violence in the recent D&G ads, people in Spain are now up in arms over the new Armani campaign which they claim is promoting sexual tourism. The ad in question, for Armani Junior, shows two young girls in make-up smiling at the camera, looking similar to many other children’s clothes adverts seen in glossy magazines. However, according to trendhunter, this one has caused serious offence- mainly it seems due to the fact that one girl is wearing a bikini. Now the Institute for the Defense of Children in Spain is demanding the pics be removed from the campaign. Is it me or does this all seem a bit of an over-reaction? Gap have just re-launched the skinny black pant and have named it ‘The Audrey Hepburn Pant’, in an attempt to gain kudos from allegiance with the iconically stylish actress. You may have already seen Gap’s new “Keep It Simple” TV spots which juxtapose classic footage of Audrey Hepburn dancing in scenes from the classic ‘Funny Face’ in skinny black pants to the 1980 AC/DC hit song “Back in Black”. Not everyone seems impressed however, and the Guardian today write about the public feeling towards another large corporation using a dead celebrity to sell a product. To be honest it looks like Gap are just re-using the idea from very clever Volkswagen and Gene Kelly advert, but with not nearly as successful an outcome. ADVERTISING HELP FROM A HIGHER POWER! This is definitely the funniest thing I have read today- ihaveanidea, Advertising’s Intellectual Archive, is excited to announce that it has commissioned a witch to forge a potion that will enhance the creative abilities of advertising professionals around the world! 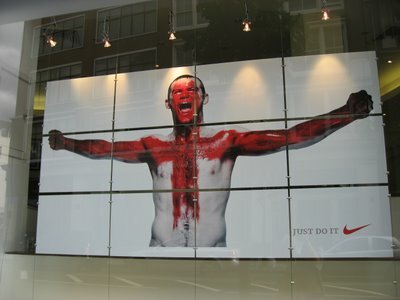 Also noticed this yesterday- interesting take on football patriotism!